This article is about the cigarette brand produced by Altria (Philip Morris). For other uses, see Marlboro (disambiguation). Marlboro (US: /ˈmɑːrlˌbʌroʊ/, UK: /ˈmɑːrlbərə, ˈmɔːl-/) is an American brand of cigarettes, currently owned and manufactured by Philip Morris USA (a branch of Altria) within the United States, and by Philip Morris International (now separate from Altria) outside the United States. Richmond, Virginia, is the location of the largest Marlboro cigarette manufacturing plant. Marlboro is the global best-selling cigarette brand since 1972. Philip Morris USA in the U.S., Philip Morris International outside of the U.S.
"Mild As May", "Come to where the flavor is. Come to Marlboro country", "You get a lot to like with a Marlboro"
Philip Morris cigarette maker, opened a New York subsidiary in 1902 to sell many of its cigarette brands. The mark "Marlboro" was registered in the United States in 1908 although no cigarette was marketed under this name until 1923. In 1924, the brand was launched. They are first marketed as "America's luxury cigarette" and were mainly sold in hotels and resorts. Around the 1930s, it was starting to be advertised as a women's cigarette, based on the slogan "Mild As May". The name was taken from a street in London where Philip Morris's British factory was located. However, as early as 1885, a brand called "Marlborough" was already being marketed as a "ladies' favorite" by Philip Morris & Co. In the 1930s, advertising for the cigarette was primarily based on how ladylike the filter cigarette was, in an attempt to appeal to the mass market. To this end, the filter had a printed red band around it to hide lipstick stains, calling it "Beauty Tips to Keep the Paper from Your Lips". Shortly before World War II, the brand's sales stagnated at less than 1% of tobacco sales in the US and was briefly withdrawn from the market. After the war, Camel, Lucky Strike, and Chesterfield were the only common cigarettes. After scientists published a major study linking smoking to lung cancer in the 1950s, Philip Morris repositioned Marlboro as a men's cigarette in order to fit a market niche of men who were concerned about lung cancer. At the time, filtered cigarettes were considered safer than unfiltered cigarettes, but had been until that time only marketed to women. Men at the time indicated that while they would consider switching to a filtered cigarette, they were concerned about being seen smoking a cigarette marketed to women. The red and white package was designed by the designer Frank Gianninoto. The emblem is placed on top of the pack and has the popular Latin expression Veni, vidi, vici ("I came; I saw; I conquered"), authored by Julius Caesar. The repositioning of Marlboro as a men's cigarette was handled by Chicago advertiser Leo Burnett. The proposed campaign was to present a lineup of manly figures: sea captains, weightlifters, war correspondents, construction workers, etc. The cowboy was to have been the first in this series. While Philip Morris was concerned about the campaign, they eventually gave the green light. Marlboro's market share rose from less than one percent to the fourth best-selling brand. This convinced Philip Morris to drop the lineup of manly figures and stick with the cowboy, later known as the Marlboro Man. From 1963, the television advertisements used Elmer Bernstein's theme from The Magnificent Seven. In the late 1960s, Marlboro "Longhorn 100's" were introduced. Although colour-coded with gold, they were full flavor cigarettes, not lights. In 1972, Marlboro became the best-selling brand of tobacco in the world. In order to comply with a 2006 court ruling in United States v. Philip Morris USA, Inc., et al., Philip Morris (and all other cigarette companies) is now prevented from using words such as "Lights", "Ultra-Lights", "Medium", "Mild", or any similar designation that yields a false impression that they are safer than regular full flavour cigarettes. 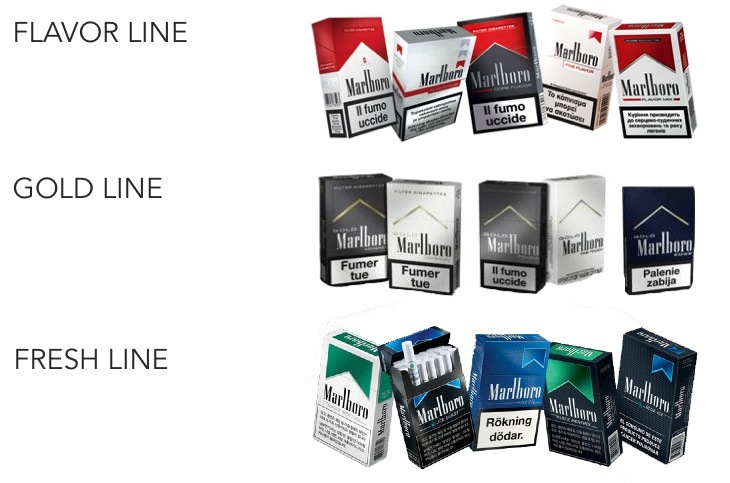 Thus Marlboro and other cigarette companies must use only color-coding instead; for example, Marlboro Lights are now called Marlboro Gold Pack. Philip Morris responded to the popularity of Pall Mall, the number three brand, by pushing Marlboro Special Blends, a lower-priced cigarette. In 2013, Philip Morris International introduced "Marlboro 2.0". The pack design was changed; the dark red was replaced with a lighter red, the "Marlboro" and Philip Morris logo became ribbed and transparent, and around 2017 a special "SmartSEAL" was introduced to keep the stored cigarettes fresh for a longer period of time. 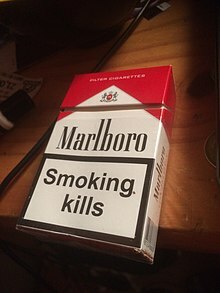 The Marlboro 2.0 packs are mainly available in Europe and some parts of Africa, Asia and Latin America, but not in the United States, Canada, Australia (due to plain packaging), and New Zealand. In 2015, Philip Morris announced they would introduce a "Firm Filter" to their Marlboro Red, Gold, Silver Blue, Ice Blast and White Menthol variants. Philip Morris managing director for the United Kingdom and Ireland, Martin Inkster, said that the Firm Filter technique was added to "offer quality you can feel, and it is a cleaner way to stub out your cigarette". In the 1920s, advertising for the cigarette was primarily based on how ladylike the filter cigarette was, in an attempt to appeal to the mass market. To this end, the filter had a printed red band around it to hide lipstick stains, calling it "Beauty Tips to Keep the Paper from Your Lips". The red and white package was designed by the designer Frank Gianninoto. The repositioning of Marlboro as a men's cigarette was handled by Chicago advertiser Leo Burnett. The proposed campaign was to present a lineup of manly figures: sea captains, weightlifters, war correspondents, construction workers, etc. The cowboy was to have been the first in this series. While Philip Morris was concerned about the campaign, they eventually gave the green light. Over the years, Philip Morris has made many billboard, poster and magazine adverts. Philip Morris also made various sports-related billboards, stickers and other memorabilia throughout the years, mainly promoting the Marlboro brand via its McLaren and Ferrari teams partnerships in places like Russia and Monaco. Through licensees, Philip Morris sells various merchandising products, such as lighters, ashtrays, sunglasses and other accessories, which are sometimes given away to the target group as part of promotional promotions. In 1983, the campaign "Marlboro Adventure Team Adventure Camp" was launched, for which the participants had to apply, there was a collection of clothing and accessories. Marlboro is well known for its association with motor racing. This started in 1972 with the sponsorship of Formula One team BRM, who took one win at the 1972 Monaco Grand Prix. In 1973 and 1974, the cigarette giant backed Frank Williams Racing Cars team, whose cars were registered as Iso-Marlboro. 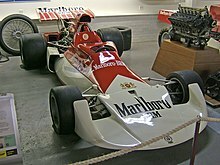 In 1974, Marlboro became famously associated with the McLaren team, which brought it its first Constructors' Championship and its drivers title for Emerson Fittipaldi. The team was successful through to 1978, with another world champion in James Hunt in 1976. Following that, the partnership went through a dry patch until Ron Dennis's Project Four Organization took over the team in 1981. Marlboro-sponsored McLaren dominated F1 for much of the 1980s and early 1990s, with Niki Lauda, Alain Prost and Ayrton Senna between them winning the Drivers' Championship all but one year from 1984 to 1991. After the departure in 1993 of Ayrton Senna, who died in an accident the following year, Marlboro McLaren did not win a race for three years. Marlboro ended their sponsorship of the team in 1996, which ended the famous red and white McLaren livery. After the end of the 1996 season, McLaren was sponsored by West from 1997 onwards. Over the years, McLaren had to alter the Marlboro livery to comply with regional anti-tobacco sponsorship laws which were in place in countries like France, the United Kingdom and later Germany. The Marlboro logo was replaced by a chevron in 1974, with a barcode in 1984 and 1985 and from 1987 to 1992 or with "McLaren" in 1986 and from 1991 to 1993 and 1994 to 1996. At the 1986 Portuguese Grand Prix, Keke Rosberg's car was painted yellow and white rather than red and white, to advertise Marlboro Lights. Marlboro also sponsored Scuderia Ferrari's drivers since 1973 (the brand appeared only on helmets and suits) but only in 1984 became a minor sponsor on Ferrari's single-seaters. Until then, Enzo Ferrari allowed only technical suppliers brands to appear on his team cars. In 1993, Marlboro began to take over as the primary sponsor, and in 1997 became title sponsor as the team was officially named "Scuderia Ferrari Marlboro". Prominent Marlboro branding on Ferrari Formula One car and team at the 2006 Bahrain Grand Prix. Over the years, Ferrari, just like McLaren, had to alter the Marlboro livery in various ways to comply with regional anti-tobacco sponsoring laws which were in place in countries like France, the United Kingdom and later Germany. The Marlboro logo was removed completely or replaced with a white space from 2000 to 2004 (The Ferrari cars had white spaces over Marlboro occasionally in 1998 and 1999), changed to a "bar code" from 1994 to 1999 and in 2005 and 2006, or the text was removed while keeping the chevron with the driver's name (1993) and in the team member clothing, the Marlboro logo became a white square with a red stripe above with the driver's written name from the 1980s until 1996. The team used a special livery for the 2001 Italian Grand Prix in remembrance of the September 11 attacks in the United States; both cars ran without any sponsorship livery and sported matte black nose-cones. In the 2005 Bahrain Grand Prix the cars sported black nosecones as a sign of mourning for Pope John Paul II. In September 2005, Ferrari signed an extension of their sponsorship arrangement with Marlboro until 2011. This agreement came at a time when tobacco sponsorship had become wholly illegal in the European Union, and other major F1 teams ended their relationships with tobacco companies. In reporting the deal, F1 Racing magazine judged it to be a "black day" for the sport, putting non-tobacco funded teams at a disadvantage and discouraging other brands from entering a sport still associated with tobacco. The magazine estimated that in the period between 2005 and 2011, Ferrari received $1 billion from the agreement. Depending on the venue of races and the particular national laws, the Marlboro branding became largely subliminal in most countries. In mid-2006, special "racing editions" of Marlboro Red were sold in the UK, with a Ferrari-inspired design, although the Ferrari name and badge were not used. 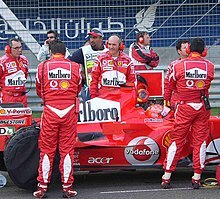 In April 2008, Marlboro displayed explicit on-car branding on Ferrari for the last time, then permanently replaced with a variety of barcodes in place of it. Since then, there were calls from leading health officials, the European Commissioner for Health and influential doctors for a review of the subliminal advertising contract Marlboro has with Advertising Guerrilla and Ferrari, due to the implications of influencing the purchase of cigarettes with possible subliminal advertising, as no tobacco products can be promoted in sporting events in Europe by law. The Ferrari team claimed the barcode was part of the car design, not an advertising message. The controversial barcode design was removed by Ferrari for the start of the Spanish Grand Prix in the 2010 season, but the barcode remained on drivers' team gear. In January 2011, the Scuderia Ferrari presented a new logo for its racing team. This logo is considered by a specialised F1-website as a subliminal advertisement for Marlboro, evocating the top-left corner design of a Marlboro cigarettes pack. In June 2011, Ferrari extended its collaboration with Marlboro through to the end of 2015, despite cigarette advertising being banned in the sport. The deal has been subsequently renewed for three more years, through 2018. In February 2018, Philip Morris renewed their partnership deal with Ferrari until the end of 2021. While the logo, which has been in place since 2011, has been removed on this year's car, it is speculated that Ferrari will put Philip Morris' non-tobacco brand iQOS instead, bypassing currently in-place laws that prohibit specific advertising of tobacco products. Marlboro had provided financial support to many racing drivers, the most illustrious of whom are Alain Prost, Ayrton Senna and Mika Häkkinen. From 1970 until the mid-1990s, the logos of the cigaretiers could be present on the combinations of the drivers if they were not present on the cars. Marlboro has also sponsored many grand prix races up until 2005. Marlboro also sponsored a multitude of other, smaller teams in Formula One. It was the main sponsor of Alfa Romeo F1 Team between 1980 and 1983, although unable to match up to its pre-war and 1950s heyday, the team only achieving one pole position, one fastest lap and four podium finishes. In 1984 the Italian clothing brand Benetton took over Alfa Romeo's livery sponsorship, which they held until the withdrawal of Alfa Romeo from Formula One at the end of 1985. The Marlboro logo was replaced with a barcode at certain races, due to tobacco or alcohol sponsorship bans in place. Marlboro sponsored the BMS Scuderia Italia team from 1988 until 1992, when Chesterfield became their main sponsor. The livery was very similar to the Ferrari and Alfa Romeo ones. The Marlboro logo was displayed on the front and side of the cars and on the drivers helmets. In some races where explicit tobacco sponsoring was forbidden, the Marlboro logo was removed. Marlboro sponsored the Arrows F1 (by the time known as "Footwork") team in 1994. While Ruffles, a potato chips brand sponsored the car, Marlboro sponsored the drivers helmets. Marlboro sponsored the EuroBrun team in 1988. The ER188, driven by Oscar Larrauri, Stefano Modena and Gregor Foitek, featured the Marlboro logo on the helmets of the drivers, as well as the Marlboro logo and name on the side of the cars. Marlboro sponsored the Fittipaldi Automotive team in 1981. The Marlboro logo was displayed on the helmets of the drivers. Marlboro sponsored the Forti F1 team in 1995 and 1996. The logo was displayed on the top side of the car, as well as on the helmets of the drivers. Marlboro sponsored the Merzario team from 1977 until the team's collapse in 1979. The Marlboro logo's were displayed on the front, side and on the drivers helmets. Marlboro sponsored the Minardi team in 1995. The Marlboro logo was displayed on the front and side of the cars and on the drivers helmets. In some races where explicit tobacco sponsoring was forbidden, the Marlboro logo was replaced with a barcode. Marlboro sponsored the Onyx Grand Prix team in 1989 and 1990. The Marlboro logo was displayed on the front and side of the cars and on the drivers helmets. In some races where explicit tobacco sponsoring was forbidden, the Marlboro logo was replaced with a barcode, but the Chevron logo was retained. Marlboro sponsored Team Rebaque in 1979. The Marlboro logo was displayed on the front and side of the cars and on the drivers helmets. In some races where explicit tobacco sponsoring was forbidden, the Marlboro logo was removed. 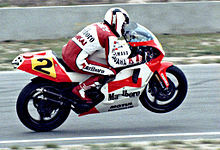 Marlboro sponsored the Rial Racing team in 1988 and 1989. The Marlboro logo was displayed on the front and side of the cars and on the drivers helmets. In some races where explicit tobacco sponsoring was forbidden, the Marlboro logo was replaced with a barcode. Marlboro sponsored the Spirit Racing team in 1983 and 1984. The Marlboro logo was displayed on the front and side of the cars and on the drivers helmets. From 2005 to 2007, GP2 Series team ART Grand Prix was sponsored by Marlboro. The Marlboro logo's were prominently shown on the car in the 2005 and 2006 seasons, but in 2007 the team only sponsored the brand on the rear wing. In countries where the sponsoring of tobacco was forbidden, the Marlboro logos were replaced with a barcode. Wayne Rainey on a Yamaha YZR500 in 1990. Marlboro entered the Grand Prix motorcycle racing in the seventies as personal sponsor of riders like Giacomo Agostini, Angel Nieto and Jarno Saarinen. In 1976, Marlboro backed Agostini's team, who raced MV Agusta bikes with little factory support. Since 1983, the cigarette brand sponsored the Yamaha 500 cc works team, which was managed by Agostini until 1989 and then by Kenny Roberts until 1996. During that period, the Japanese bikes won six World Championships and, as a result of their sponsorship, Marlboro decals on race replica bikes became one of the most popular decal kits that were available. In the 1990s, Marlboro's livery also appeared on other bikes, especially the Hondas entered by Team Pileri (from 1992 to 1995), Pons Racing (in 1993) and Erv Kanemoto's team (in 1997 and 1998) who achieved the 1997 250 cc World Championship with Max Biaggi. The Yamaha works team was again associated with Marlboro between 1999 and 2002. Marlboro sponsored the Ducati Corse MotoGP team from 2003. Casey Stoner took his first MotoGP title in 2007. As of the 2009 Grand Prix motorcycle racing season they were only allowed to brand the bikes at one round, in Qatar at the Losail International Circuit, using the barcode in other races. The controversial barcode design was then removed by Ducati for the start of the French motorcycle Grand Prix in the 2010 season. In January 2011 the Ducati Team presented a new logo which was regarded as a subliminal advertisement for Marlboro, evocating the top-left corner design of a Marlboro cigarettes pack, similar to the one used by Ferrari. In January 2018, it was speculated that Ducati would carry sponsorship by Philip Morris' non-tobacco brand iQOS instead, bypassing currently in-place laws that prohibit specific advertising of tobacco products. Marlboro sponsored the Yamaha Dealer Team from its inaugural season in 1988 to 1990. Penske PC-22 driven by Emerson Fittipaldi in 1993. Marlboro sponsorship in IndyCar dates back to 1986 when the livery appeared on the Emerson Fittipaldi's car entered by Patrick Racing. 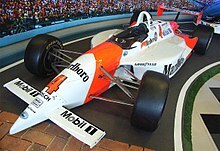 In 1990 Penske Racing hired Fittipaldi and started a 20 years-long association with Marlboro and its distinctive red and white livery. However, in the 2007 season Marlboro logos were replaced with 'Team Penske' but the team retained the color scheme as Philip Morris USA was still Penske's main sponsor. 2009 was the last year of the Penske-Marlboro association. Since their start in Formula One, Marlboro has also sponsored numerous teams and races, from Joest Racing in Group C in 1983 to Toyota at the 24 Hours of Le Mans in 1999 (despite a tobacco ban in France). Marlboro sponsored the Marlboro Masters Formula Three race in Zandvoort. Marlboro has a long history in rallying sponsorship, including the factory World Rally Championship teams of Lancia (between 1972 and 1974), Mitsubishi (from 1999 to 2002), and Peugeot (from 2003 to 2005). The cigarette brand appeared on helmets and suits of some of the best rally drivers, being personal sponsor of Markku Alén, Timo Salonen, Juha Kankkunen, Miki Biasion and others. Between 1987 and 1992, Marlboro backed Carlos Sainz, appearing on his cars (Ford Sierra in 1987–88 and then Toyota Celica since 1989). In 1993 the cigarette brand started an association with Belgian rally driver Freddy Loix, who was racing for Opel in the Belgian rally championship. Between 1996 and 1998 Loix raced with Toyota Team Belgium in the WRC, carrying the Marlboro livery on his car. In 1999 he moved to Mitsubishi Ralliart works team, with the iconic livery remaining on successive Lancer Evolutions until the marque's temporary WRC withdrawal at the end of 2002. Marlboro also sponsored the cars of Emirati rally driver Mohammed bin Sulayem and has sponsored a number of rallies including the Safari Rally (between 1982 and 1990), the Rally Argentina, the Rally of Lebanon, the Jordan Rally, and the UAE Desert Challenge. Marlboro also sponsored the Holden Dealer Team from 1974 through to 1984. The Marlboro branding gave rise to some of Australia's most prominently recognizable lauda cars such as the L34 and A9X Torana, as well as the famous VK Group C "Big Banger" Commodore of Peter Brock and Larry Perkins Bathurst winning fame. Marlboro sponsored the Italo-American IMSA SportsCar Le Mans GT team Risi Competizione since 2004 but Risi Competizione opting to invisible the Marlboro logo due to the team respecting Tobacco Master Settlement Agreement regulations and also ban of cigarette advertising in sports. Marlboro sponsored the Thomas and Uber Cup from 1984 to 1990, as well as the Sudirman Cup from 1991 to 1995 and 2001 to 2013. 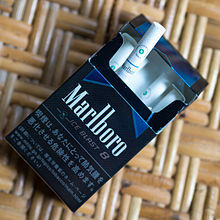 A Japanese pack of Marlboro Ice Blast. This mentholated cigarette also contains a menthol capsule in the filter that can be cracked open by the smoker. Phillip Morris markets cigarettes, snus, and Heatsticks under the Marlboro brand. Philip Morris International organized Marlboro products into three divisions – Flavor line, which are original red/full flavor cigarettes, Gold line are former lights and Fresh line comprises flavored cigarettes. Philip Morris sold the Canadian rights to the "Marlboro" name to Imperial Tobacco Canada in 1932. After the brand's successful American relaunch in the 1950s – which later became well known to Canadians through exposure to the brand's international sponsorships and advertising – Philip Morris tried several legal manoeuvres in attempting to reacquire the Canadian rights, to no avail. Imperial Tobacco continues to sell a line of cigarettes under the Marlboro name in Canada, albeit with very different packaging from that of the Philip Morris product. Philip Morris retains the rights to the "rooftop" trade dress and other elements of Marlboro's branding which were developed after the 1932 sale, and has historically used that trade dress in Canada in combination with the names "Matador" or occasionally "Maverick" for a line of Virginia blend cigarettes. In 2006, Philip Morris International's Canadian affiliate Rothmans, Benson & Hedges introduced a new product with the "rooftop" trade dress, and marked as being the "World Famous Imported Blend", but not bearing any actual brand name. This led to a legal challenge from Imperial, contending that the new packaging created customer confusion by merely suggesting the Marlboro brand, thereby infringing on Imperial's Canadian trademark rights. Canada's Federal Court of Appeal ruled in favour of Imperial in June 2012. The judgment noted that Canadian regulations which (in most cases) prohibit the public display of tobacco products at retail locations – i.e., customers must ask for a brand by name – exacerbated the situation, as there were now two products that customers might be referring to when asking for "Marlboro". Though PMI is expected to appeal, shortly after the ruling it began using the brand name "Rooftop" on packaging for the previously unbranded cigarettes. ^ "Marlborough". Oxford Dictionaries. Oxford University Press. Retrieved January 10, 2019. ^ John Wells (2010-01-06). "John Wells's phonetic blog: Marlborough". Phonetic-blog.blogspot.com. Retrieved 2011-08-03. ^ a b "Building Leading Brands". www.pmi.com. ^ "Marlboro cigarettes - name origin of the brand - High Names agency". 11 January 2013. ^ "snopes.com: Marlboro and the KKK". snopes.com. 27 April 2011. Retrieved 19 June 2015. ^ "History of Philip Morris". sourcewatch.org. 1987. Retrieved 24 November 2015. ^ a b Holt, Douglas; Cameron, Douglas (2010). Cultural Strategy. Oxford University Press. ISBN 978-0-19-958740-7. ^ a b c d e f g Erin Barrett and Jack Mingo, ed. (2003). W.C. Privy's Original Bathroom Companion. St. Martin's Press. pp. 407–410. ISBN 0-312-28750-X. ^ "Vintage Tobacco/ Cigarette Ads of the 1960s (Page 26)". Vintageadbrowser.com. Retrieved 2017-06-04. ^ "The Marlboro Man Still Sells Cigarettes". ^ United States v. Philip Morris USA, Inc., et al. , 449 F.Supp.2d 1 (Dist. Court, Dist. of Columbia 2006). ^ Craver, Richard (2012-09-26). "Reynolds to offer more menthol versions of Pall Mall cigarettes". Winston-Salem Journal. ^ "reklamehimmel: Abschied von gestern: Markennamen sind auch nicht mehr das, was sie mal waren". reklamehimmel.typepad.com. ^ "Philip Morris reveals new look for Marlboro". 29 January 2015. ^ "Stanford Research into the Impact of Tobacco Advertising". tobacco.stanford.edu. ^ "Marlboro cigarette ads". www.vintageadsandstuff.com. ^ "Marlboro Stockfoto's en -beelden - Getty Images". www.gettyimages.nl. ^ "Belarus: Minsk Outdoor Advertising: 20/07/2005 / Marlboro Red Racing School in Minsk, Belarus". www.data.minsk.by. ^ "Ferrari extends deal with tobacco company Philip Morris". ^ F1Writers™. "Vettel and Marlboro ads around Monaco pic.twitter.com/slnmOCTLhm #F1 #MonacoGp #Vettel". ^ "Marlboro F1 World Championship Team Stickers". RetroGP. ^ "Original marlboro jean alesi oreca f3000 team 1988 period race sticker adesivo". Pinterest. ^ "Vettel, imagen de un anuncio de Marlboro en Mónaco". 23 May 2015. ^ "Marlboro cigarette advertising in Monaco at Monaco GP". Motorsport.com. ^ "Marlboro advertising Formula One F1 sponsor Car Postcard". www.hippostcard.com. ^ "Book Formula 1 race car driver Niki Lauda, Marlboro Autocourse. - Catawiki". Catawiki. ^ "Eurosport Yahoo News, April 29, 2010". Uk.eurosport.yahoo.com. Retrieved 2011-08-03. ^ "Ferrari removes bar code design from car". USA Today. May 7, 2010. ^ "Le nouveau logo de Ferrari propice à polémique?". Toilef1.com. January 28, 2011. Retrieved 2011-08-03. ^ "Ferrari extends deal with tobacco company Philip Morris, June 16, 2011". En.espnf1.com. 2011-06-14. Retrieved 2011-08-03. ^ Duff, Alex (13 May 2015). "Philip Morris can't kick 20-year Ferrari Formula One habit". Bloomberg L.P. Retrieved 6 January 2016. ^ "Philip Morris extend Ferrari sponsorship deal - PlanetF1 : PlanetF1". www.planetf1.com. ^ "Ferrari sluit nieuwe meerjarige deal met Marlboro". ^ "Marlboro will be advertised on the 2018 Ferrari car". 21 February 2018. ^ "Ferrari change their logo". 2 January 2018. ^ Mitchell, Malcolm. "1995 Formula 1 Programmes - The Motor Racing Programme Covers Project". progcovers.com. ^ Mitchell, Malcolm. "1998 Formula 1 Programmes - The Motor Racing Programme Covers Project". progcovers.com. ^ Mitchell, Malcolm. "2005 Formula 1 Programmes - The Motor Racing Programme Covers Project". progcovers.com. ^ "Under a misleading "ex-Alesi" Ferrari F93A F1 livery, in fact a hybrid: Lola BMS Scuderia Italia Ferrari T93-30 at Modena Trackdays". Motorsport.com. ^ "bms scuderia italia - Tumblr". ^ "J J Lehto BMS Scuderia Italia Dallara Judd 192 F1. 1992 British GP Silverstone. - a photo on Flickriver". www.flickriver.com. ^ "Footwork Arrows FA15 Formula 1 Car". 12 July 2017. ^ Cardoso, Danilo. "A história da Arrows F1 Team - Equipes Históricas da F1 - Super Danilo F1". www.superdanilof1page.com.br. ^ "F1 Teams of the Past – Eurobrun Racing". 28 January 2013. ^ "Fórmula 1 del ayer". Pinterest. ^ "1981 British Grand Prix". ^ "F1 Teams of the Past – Forti Corse". 12 January 2013. ^ F1, STATS. "Forti FG01-95 • STATS F1". www.statsf1.com. ^ "F1: Former F1 team owner Guido Forti passes away - Auto123.com". www.auto123.com. ^ "F1 - Merzario: un cavaliere del rischio di nome Arturo - Storia - Motorsport". 11 March 2016. ^ "1978 Formuła 1". Pinterest. ^ "Arturo Merzario (South Africa 1978)". DeviantArt. ^ "F1 - Pierluigi Martini: le grandi imprese con la Minardi - Storia - Motorsport". 16 December 2011. ^ "Livery Histories #5: Minardi". 19 January 2015. ^ "Flickriver: Onyx Grand Prix Cars pool". www.flickriver.com. ^ "Onyx Grand Prix - Formula Fan". formula-fan.ru. ^ "F1 - Prywatne zespoły". Pinterest. ^ "F1 - Il Gotha dei piloti "con la valigia" - Storia - Motorsport". 16 December 2015. ^ "8W - Who & What? - (Hector) Rebaque". 8w.forix.com. ^ "Rial Racing Rial Arc2 Ford Cosworth Dfr Stock Photos and Pictures - Getty Images". www.gettyimages.fi. ^ "Rial Racing T Shirt". RetroGP. ^ "rial racing - Tumblr". ^ "Spirit 201C, Honda V6, GP Europe 1983 - Sudio27 1:20". Modeler Site. ^ "Racing - 1983". Stefan Johansson Växjö. ^ "Nico Rosberg - ART Grand Prix". www.art-grandprix.com. ^ Magazine, Speedsport. "Michael Aleshin - ART Grand Prix: GP2 Series 2007 - Photo 2/38". www.speedsport-magazine.com. ^ "Lucas Di Grassi - ART Grand Prix". www.art-grandprix.com. ^ Magazine, Speedsport. "Alexandre Premat - ART Grand Prix: GP2 Series 2006 - Photo 1/28". www.speedsport-magazine.com. ^ "History". Pons Racing. Archived from the original on 22 March 2012. Retrieved 24 November 2012. ^ Nugnes, Franco. "Ducati could run e-cig branding in 2018 MotoGP season". ^ "World Superbike entry list for 1988". Motorcycle Racing Online. ^ "World Superbike entry list for 1989". Motorcycle Racing Online. ^ "World Superbike entry list for 1990". Motorcycle Racing Online. ^ "Peter Goddard - Photos". www.petergoddard.com. ^ "Penske loses Philip Morris sponsorship". Autoweek. Crain Communications. 23 February 2010. Retrieved 21 November 2014. ^ "Turkey: Middle East Champion Mohammed bin Sulayem Drives to Victory in Bosphorous Rally". ITN Source. 18 May 1991. Retrieved 21 December 2014. ^ "All systems go for weekend's Marlboro car rally". dailystar.com.lb. 30 June 2001. Retrieved 21 December 2014. ^ "Bin Sulayem adds another feather to his cap". gulfnews.com. 29 September 2002. Retrieved 21 December 2014. ^ Sharp, Martin (5 December 2009). "The supercar sheik … who enjoys a drive in the country". telegraph.co.uk. Retrieved 21 December 2014. ^ "1982 Thomas Cup Final". mynahbird20000.blogspot.nl. ^ "1949 Thomas Cup". mynahbird20000.blogspot.nl. ^ "1984 Thomas Cup Final pt 1". mynahbird20000.blogspot.nl. ^ a b "Marlboro.com – Official Website for Marlboro Cigarettes". ^ Felberbaum, Michael (June 26, 2014). "Philip Morris Int'l to Sell Marlboro HeatSticks". Richmond, Virginia: ABC News. AP. Retrieved June 28, 2014. ^ "Brand Architecture Marlboro". MARLBORO BRAND ASSET MANAGEMENT. ^ "Product architecture – Flavor line, Gold line, Fresh line (Image)". annetonia.files.wordpress.com. October 2012. Retrieved 2017-06-04. ^ "Philip Morris' Marlboro Brand Architecture". ^ a b Gauthier, Johanne (2012-06-29). "Marlboro Canada Limited v. Philip Morris Products S.A. (2012 FCA 201)". Federal Court of Appeal (Canada). Retrieved 2012-09-15. ^ a b Krashinsky, Susan (2012-08-03). "Why Marlboro Country ends at the border". The Globe and Mail. Retrieved 2012-09-15.